Getting a squat rack for your home gym may be one of the best investments you can make for your fitness journey. Known also as the power rack or power cage, this piece of gym equipment is known for its versatility-you can do dips, pull-ups, and more besides the weight training. Squat racks are also known for their safety features, which makes them ideal for fitness buffs who are planning to go at it alone without a spotter. While they are certainly a great addition to your home or garage gym, squat racks don’t come cheap either. Of course, you want to get the most out of your investment. From choosing the best squat rack to fit your needs-and your space-to what you need to keep an eye out for, this article’s got you covered. Amp up your gains this 2018 with some of the best squat racks for your home gym. When measuring out space where you will enshrine your new squat rack, you should never forget to check out your ceiling height. After all, it’s no use having a pull-up or chin-up bar if it’s going to be just an inch away from your ceiling. If ceiling height is your problem, then this squat rack is for you. You’ve probably heard of the line of beasts Titan Fitness calls power racks and the T-3 is one of those. This squat rack can take on up to 1,000 lbs. of weight. Aside from that, it was made to fit in a room with low ceilings. How low? Well, you can go as low as 7 feet and still not crash your noggin into the ceiling every time you think of doing chin ups. 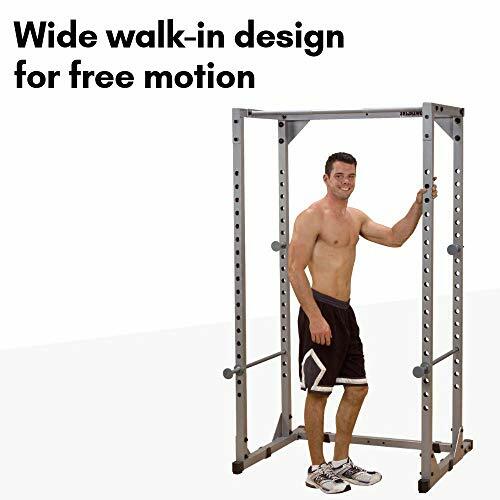 The extra deep design also ensures you have enough room to do the large variety of exercises only a power rack can give you. And speaking of variety, you can also upgrade this beast with add-ons for added versatility to your exercises. Can take up to 1,000 lbs. of weight. Can be upgraded with different accessories to add versatility to your exercises. Pretty affordable for the quality. The “deep” design allows for a lot of space for working out. Made to fit low ceilings. Packaging can be a little sucky-one buyer reported having to cart the parts in piece by piece because they tore through the box. The Rep Power Rack PR-1000 is a great consideration for a squat rack for your home gym. Although squat racks don’t come cheap-they are at least a couple of hundred dollars-you get a lot of features for the cost of this one unit. 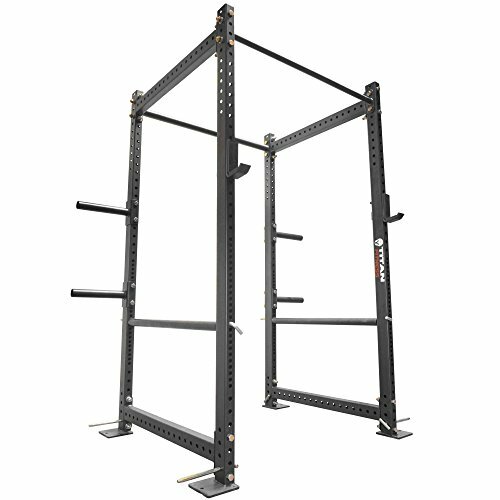 Aside from squats, you can also do pull-ups and chin-ups with this beast as it comes with a pull-up bar with a 400-lb capacity. You also have the option to purchase an upgrade with a dip station with a 400-lb capacity, which can either be attached to the left or the right side of the rack. The entire squat rack measures 83 inches (height) x 48 inches (width) x 48 inches (depth) and 58 inches wide at the rear bottom brace. It is coated in matte black powder and comes with plastic J-cups to protect the knurling of your barbell. Sturdy piece of equipment and well-made. Has a maximum weight capacity of up to 700 lbs. This is not to be confused with the 400-lb. capacity of the pull-up bar and (optional) dip station. Pretty easy to set up, especially if you have help. The hole-spacing measures two inches from center to center. Between the top and bottom holes, the space measures about an inch. Buyers report great customer service from the company, Rep Fitness, who was eager to assist and answer any questions. Some buyers reported a bit of damage when the unit arrived but nothing major that could affect the strength of the bar overall. Tends to wobble a bit when using the optional dip station, which can be remedied by weighing it down with some plates or sandbags. The thing about squat racks is that you can do so much with them that you can practically build your home or garage gym about it. This unit from Body Power is no different. 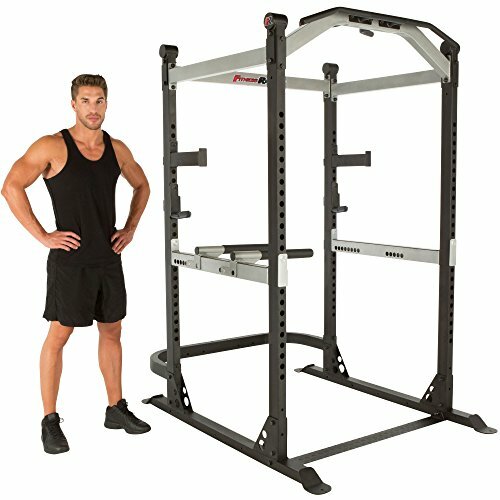 The Body Power Deluxe Rack Cage System has all the fancy trimmings you would need for only a couple of hundred dollars. That might seem like a lot of money at first but if you have to buy each piece of equipment on its own, the expenses would add up faster than you can blink. This squat bar comes with 2 full-length safety bars and 2 J-hooks. It also comes with 2 adjustable weight bar safety catches. Aside from that, there are two pull-up bars and two dip stations. It can accommodate either a 6-foot or 7-foot Olympic bar with no problems. The entire unit measures 63 inches x 45 inches x 85 inches. Space inside the cage can be very small and users have the tendency to bump up against the weight plate holders while doing squats. You can remove the weight plate holders and store your plates somewhere else to solve this problem. 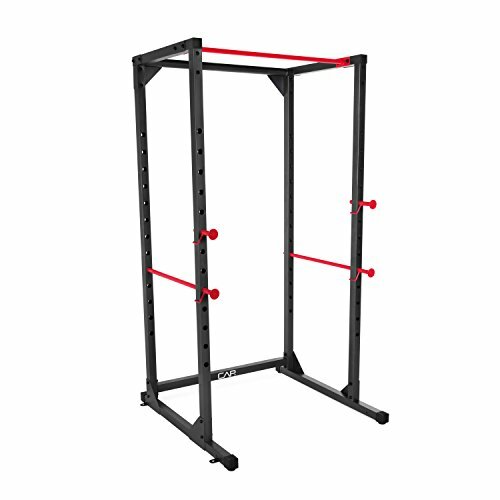 The entire unit is a bit unbalanced and it is advisable to take advantage of the floor anchors and really mount the entire squat rack to the floor to keep it from rocking when using the pull-up bars or dip stations. Seasoned weightlifters will probably scoff at squat racks with a maximum weight capacity of 700 lbs. When you’re lifting ungodly weights, you need a squat rack that can match you toe to toe when it comes to weight capacity. The Fitness Reality X-Class Light Commercial High Capacity Olympic Power Cage can take care of your concerns if that is the case. With a maximum weight capacity of 1,500 lbs., this squat rack is as much a weightlifting beast as you are. Not only that, it has a multi-grip chin up and pull up bars as well as an adjustable dip station. You can further expand the exercises you can perform of it by upgrading your unit with the optional lat pulldown attachment and utility bench from the same manufacturer. This power cage will require some assembly and the entire unit measures 71.5 inches (length) x 52 inches (width) x 86 inches (height). The entire frame also comes with a 10-year warranty and the other parts have a 3-year warranty. Maximum weight capacity of 1,500 lbs. Assembling the squat rack is quite easy except for the part where you get to the safety bars. Trying to adjust these bars and getting the pegs to align can be quite a hassle. The thing with the really fancy squat racks is they tend to take up a lot of space. Granted that you won’t need to get a lot more equipment once you have a unit that allows you to practically do anything with it, it still won’t cut it if you can hardly fit it into your apartment or living space. The Valor Fitness BD-7 Power Rack with Lat Pull Attachment can help you do a lot of the exercises you can do in a gym-grade squat rack while occupying a smaller space in your home or garage gym. Compared to squat racks with more or less the same features, it is more affordable, too. In short, you get a lot of bang for your buck with this one. 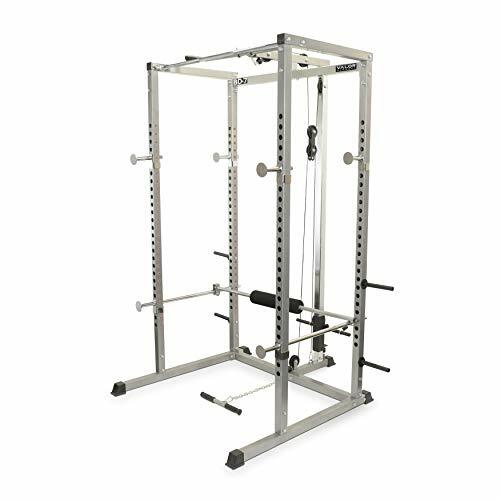 This squat rack is made of 12-gauge steel with a lat pulldown station with a plate loading carriage. Aside from that, it has a pull-up station with pull up bars made of solid steel with knurled grips. While it is true that space is a matter of concern for most of us when considering a squat rack, there are also those who prefer to sweat it out without squeezing themselves into a slender cage. For those who need space but have little foot space to spare, then you might want to get a roomier squat rack that enables you to perform your exercises without hindering freedom of movement and taking up too much floor area. The Body-Solid GPR378 Pro Power Rack is made of heavy-duty 11-gauge high tensile strength steel frames with a maximum weight capacity of 800 lbs. for all components including the spotter bars. The entire unit measures 53 inches x 50 inches x 84 inches, according to the Amazon site but consumers have reported a height of 78 to 79-something inches. When it comes to all things about strength, no doubt you’ve heard of CAP Barbell and the numerous products they offer to improve your strength from your grip to-you got it-squat racks. With all the experience they have when it comes to building strength and muscle, it’s no wonder that they managed to produce a pretty solid squat rack that is way easy on the budget. If you’re looking for a brand new and solid squat rack but don’t have that much to spare, then you should check out this offering from CAP Barbell. Compared to the other squat racks, this is pretty much on the lower end of the spectrum. 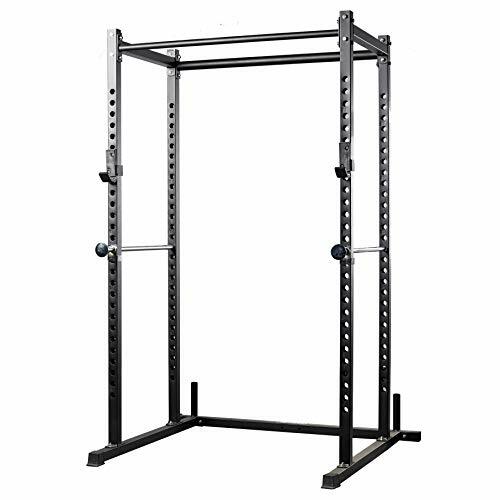 It has all the basics of a squat rack complete with a pull-up bar and safety catches, minus the soul-draining price. The catch? Compared to most squat racks in this review, this one only has a maximum weight capacity of 500 lbs. This might be good for a newbie but seasoned pros will probably want to overlook this one. The CAP Barbell Full Cage Power Rack measures 43.31 inches (length) x 44.09 inches (weight) x 72.05 inches (height). Maximum weight capacity of 500 lbs. This might be a great squat rack for newbies to weight training but not so good for seasoned pros. Another pretty solid squat rack from Body Solid is the Powerline PPR200X Power Rack. 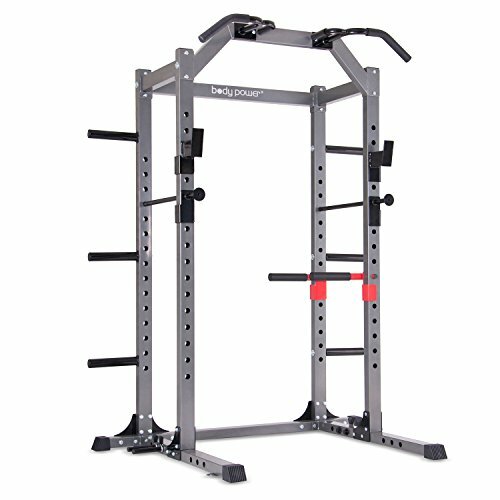 Although not really in the same league as the GPR378, this is a pretty solid squat rack that will allow you to do a lot of different exercises that the basic squat rack can afford-squats, lifts, pull ups, chin ups, and bench presses, if you can get the additional equipment for it. If you want to add more to your repertoire of exercises on this unit, you also have the option of availing of several upgrades to make the most of this squat rack. This unit measures 44 inches (width) x 82 inches (height) x 46 inches (depth). Squat racks are a great addition to your home or garage gym but you know us-we like to give you guys the option to buy in or opt out of all things fitness. Squat racks are no different. Let us break down the pros and cons before you jump on the bandwagon and get yourself a fancy squat rack you probably won’t use. There is also a foam-covered utility bar you can use for curls. One of the best features of the squat rack is safety. Weight training is a dangerous business if you’re not careful with it. I’m sure you’ve heard horror stories of athletes getting crushed under the weight of a barbell during a bench press or squat. This is why you need someone to look out for you especially when you’re new to weight training, a.k.a. the spotter. The squat rack is designed to function as a mechanical spotter for those free weight training exercises. It has safety pins and notches on the posts which can catch the barbell on if it slips or if you’re having difficulties with, particularly hard routines. It’s called a power cage for a reason. Squat racks or power cages are not only good for squats-they usually come with an assortment of features that can help you do other things on it like chin-ups, pull-ups, and even dips. Now, that’s a powerhouse of an equipment! Unlike Smith machines where you will be forced to assume an unnatural position while training, squat racks are designed for free weight training. Working out with free weights means that you use both the primary muscles needed to lift and push the weight as well as the stabilizer muscles. This translates to you getting stronger and building more muscles. By far, the cost is one of the reasons buyers will balk at the purchase of a squat rack because they don’t come cheap. Squat racks can range from several hundred to a thousand dollars. You’re going to have to fork over for all the additional equipment and an Olympic barbell set. Also, the fancier it gets, the more the price will soar. A cheaper alternative is the squat stand but you’ll lose the additional safety features and versatility that comes with a fully-equipped squat rack. Lawd almighty but the squat rack does take up an unholy amount of space. If you’re living with limited real estate or a lower ceiling, you might want to opt out of that fancy squat rack you’ve been eyeing. While it does occupy a lot of space, you can do a lot with it and won’t need separate equipment for bench presses, chin-ups, dips, etc. so you might end up saving space anyway. Read more : High Bar Squats vs. Low Bar Squats: Which one is better? Now that we’ve laid out the pros and cons and you still wanna get a new squat rack, let’s go to the things you need to seriously consider before buying one. We’re not only talking floor area but ceiling height here. 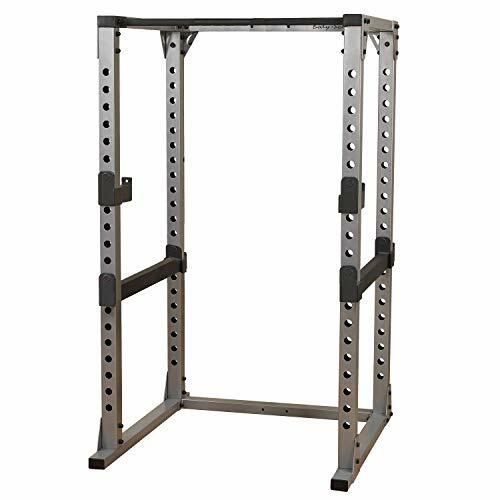 Squat racks with additional features for pull-ups and chin-ups will need more overhead space or you’ll be pulling yourself up to a hole in your ceiling. Not only that, you need to consider space for your weights as well as for freedom of movement. The safety features are probably the top reason you’re going with a squat rack aside from the versatility and freedom you get with every workout. Safety pins are an absolute must for your squat rack. You will also want to check out the hole-spacing between them so you can adjust them to the right height. The smaller the distance between the holes, the better. A distance of 1 inch between holes can give you a great deal of flexibility for adjustment while a 2-inch gap, not so much. Where are you gonna put your barbell and all the plates you’re gonna use? If you want to make the most out of your strength and energy for every exercise, it would be a great help if you got a squat rack with ample storage or weight holders on each side. Having the plates stored nearby in your squat rack means you can focus your energy on doing those weight training exercises instead of lugging your plates back and forth between your squat rack and storage. Read more : Squat Rack vs. Power Rack? The Dilemma of Choosing One or the Other Ends Here! You might think it’s still a long way off but we’re telling you this-if you’re serious about getting fit and working out, you’re gonna get strong fast. For that, you’re gonna need equipment that can keep up with your needs because you’re going to need heavier weights. Your squat rack is not exempt from this. Newbies are looking up to a maximum of 700 lbs. while more experienced weightlifters should be considering squat racks with a maximum capacity of 1,000 lbs. Squat racks generally have a weight capacity of 400 to 1,000 lbs. Generally speaking, the higher the maximum weight capacity of a squat rack, the more durable it will be. It might be tempting to get a squat rack with all the bells and whistles but it will not do you any good if you can barely use it. When getting yourself a new squat rack for your home or garage gym, you should also consider the ease with which you will be able to set it up as well as use it. The better you know and understand your own gym equipment, the more you will be able to get out of it. Aside from being able to do free weight training exercises with it without a human spotter, squat racks can allow you to do much more in it. For example, did you know that the safest way to do bench presses is in a squat rack? Added features will help you make the most out of your squat rack but these can also hike up the cost of the unit itself. It is important to take note of these so you don’t have to fork over more cash for secondary expenses. A squat rack can be anchored to the floor or it may come with a stabilizer, which usually gets in the way. If you are getting a unit that has stabilizers, make sure it will not get in the way of your exercises or one that stays as close to the ground as possible. One of the major drawbacks of the squat rack, aside from its massive size and the space it occupies, is the cost. A good squat rack can cost anywhere from several hundred to a thousand dollars. Consider your preferences and needs first and align it closely with your budget. You do not need to sell your soul for the chance to get fitter but do not compromise your safety and your workouts with substandard equipment either. Read more : Hack Squats and Hack Squat Alternatives for Your Next Leg Day! The Titan Fitness T-3 is a pretty popular choice for squat racks and with good reason! It is a very sturdy piece of equipment, although it is easy to assemble. Although it was made to fit in spaces with low ceilings, it is pretty roomy inside and will not make you feel cramped while you’re using it. For added versatility, you can also add a couple of accessories so you can do more in it. Although it will wobble a little, you can just weigh it down with some weights and you’re all set. Did your favorite squat rack make it to our list? Let us know in the comments below and don’t forget to share this article with your family and friends to help them build their own dream home/garage gym!